Hello everybody and welcome back to Everything Ham Radio. In my last post we touched a little bit on APRS. In this post we are going talk a little more about it and go into some other uses. APRS is a system with many uses and we were only able to talk about a few of them in Episode 6 of my podcast. One of the uses that we didnâ€™t talk about in my last post/podcast is the use of APRStt. APRStt is a system that allows the remainder of the amateur radio community that doesnâ€™t have APRS capabilities interact with the APRS system. APRStt is a DMTF interface that allows a user that doesnâ€™t have APRS to send a DTMF sequence that corresponds with their call sign and it will populate their call sign on the APRS system. So what about their location on a map? There are extra characters that you can include in your DMTF sequence where you can input a two character latitude and longitude coordinate. It would show you exact position but it will show within like 30 miles of your location I believe. In some cases this wonâ€™t exactly help, but you take this a step further. One the server-side so to speak, the side that does the receiving of the DTMF code, you can set up a file that has things like certain locations that can be translated into actual locations. Letâ€™s say that your club is participating in a bike race and you have operators at every rest stop. You can set up your server file to include rest stop locations. Then when the operator gets to the rest stop, they can send their DTMF call sign along with their rest stop code and it will add them to your APRS map at the location of the rest stop. For more information about APRStt, click here. Another feature or use maybe is the APRS Internet System or APRS-IS. Like a lot of things now a days, the internet is an integralÂ part of the hobby for certain things. What APRS-IS does is bridge the gap between the RF side of APRS to the internet to spread the reach of APRS. There are several websites that you can go to to see APRS activity anywhere in the world. The two most common ones are probably aprs.fi and findu.com. You can use something like this feature to include those operators that do not have an APRS radio to still be able to send and receive data text messages. There are several radios that can receive DTMF messages but only 6 characters in length. 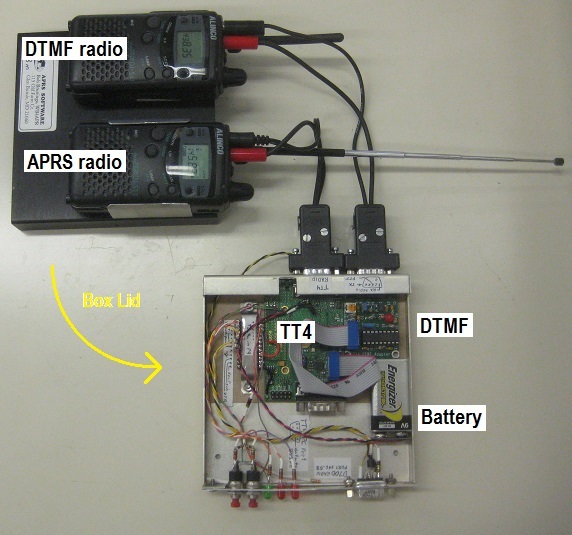 This gateway can receive APRS messages and forward them through DTMF codes over the air. Things like voice frequency, bearing, distance and speed, short text messages and even weather data can be sent. With only a limited number of characters, you have to know what you are looking at in order to read the messages, but it is still possible. You can even use this feature as a net control station. If you have a DTMF decoder program running on your computer and a radio hooked into it to receive the information, people in the field could send you short messages. This feature Iâ€™m not to sure about though, personally, this seems like extra work on the part of the user in the field but it could be done. For more information about this topic, click here. This function I have mixed feelings about. If you donâ€™t know, RFID stands for Radio Field Identification. Iâ€™m sure if you didnâ€™t know what RFID was, you still have seen the concept. It is what is used in things like ID badges at work, where you wave it near some detector plate and it unlocks a door for you or something along those line. With APRS-RFID, it was conceived that you could place a RFID reader somewhere, and if you had a RFID tag on you, that a APRS beacon would be transmitted with your call sign and where you are at. This could be used for things like a hamfest(like Dayton), or you club house, or some event that you are helping with. The limitation to this, is that the RFID tag that the operator wears has to be within about 8-12 inches from the readerâ€™s antenna or sensing element. This doesnâ€™t give you a very big range to work with for non-marked areas. I believe they actually did try this at Dayton one year, but they had padâ€™s put down that were marked where the RFID reader was on the pad and the people whoÂ tested it put the RFID tags in their shoes. Iâ€™m not too sure that I want something in my shoe while I am walking around Dayton. For more information about APRS-RFID, click here. APRS Digipeaters can be almost anywhere. The could be at a repeater site, they could be in your neighborâ€™s house(If they are a ham), they could be at your club station, you could setup a mobile digipeater in your car, there could even be a digipeater in outer space. The ISS and several amateur radio satellites have APRS digipeaters in them. Seeing the ISSâ€™s call sign in a APRS packet stream would be pretty neat but the operational use of it would only be about 10 minutes I believe. We have talked about a bunch of different hardware options with APRS, but we really havenâ€™t touched on the software side of things. Here are a few links to different programs that you can use with APRS. A couple of them I have used, others I have not so I donâ€™t know how good they are other than just what any reviews might say. If any of you reading this has tried any of these or any others that are not on this list, please comment below. UI-View – I have used this program, but it has been about ten years ago. I know it was a pretty good program back then and I’m pretty sure they have made it better since I used it last. When I used it, it still used static maps and was just integrated the use of a street atlas program. APRSPoint – This is a windows program. It requires Map Point to work. The last update that their website shows is 2011, so I donâ€™t know how up to date it is and it probably wonâ€™t run on windows 8 or above. I guess that just about wraps it up for this post. There is so much that can be done with APRS that I had no idea. I am loving writing this blog and now doing a podcast so much, because I pretty much learn something new with every post. Thank you for your continued support by reading my blog and listening to my podcasts. If you want to help out even more by making a monetary contribution, you can go to the About Me page and there is a donate button there. Please subscribe to my site in order to get emails on when I publish a new post or podcast episode. Just click subscribe on the menu, fill out the form and click the submit button. Then check your email. You will be getting an email from me with a link that you will have to click on in order confirm that it was you who subscribed to my site. I hate spam as much as you do, so I have the double opt in feature turned on and will NEVER sell or give away your email or personal information.